The market is gaining rapid growth owing to the increase in usage of deodorants, hair care, skin care, body care products. Also, growing demand for household products such as air fresheners, insecticides, cleaning & polishing products to maintain hygiene at home is further fueling the market demand. Aerosol cans are portable, easy to use, and chemically inert and possess excellent barrier properties, thus are used across various end-use industries. A growing trend of easy to use, easy to handle products followed by rapid expansion of the retail sector is contributing the market growth. The latest report by Value Market Research expects the Global Aerosol Can Market to reach USD 11.5 billion by 2025. It was valued USD 7.9 billion in 2018. The report foresees a 5.5% CAGR from 2019 to 2025. On the basis of product, metal grabbed the leading position by accounting the highest market share in the year 2018. Growing adoption of lightweight packaging with design modification to cater end-user’s need is driving the segment growth. Also, rising concern regarding recyclability of the material is further pushing the demand for metal aerosol cans. By application, personal care emerged as the leading segment in 2018. The growing trend of beautification has resulted in an increase in demand for skincare, haircare, personal care products especially by the female population is driving the segment demand. Ongoing urbanization, increasing awareness regarding beauty products, rise in spending towards self-care is boosting the segment growth. Geographically, North America dominated the regional market owing to rising demand from end-users. Rising disposable income coupled with an increase in funding for manufacturing recyclable and sustainable aerosol cans is further fueling the market growth. 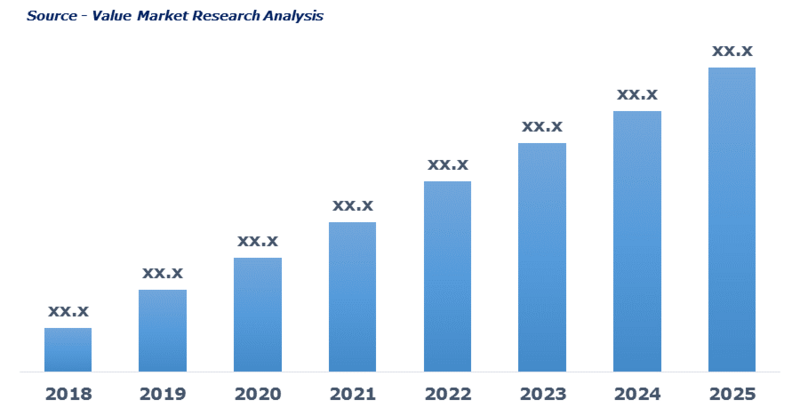 As per this study the Global Aerosol Can Market was valued USD 7.9 BN (by revenue) in 2018 and is anticipated to reach USD 11.5 BN by 2025 with a CAGR of 5.5%. Aerosol can is the type of container that stores substances such as paint, polish, pesticides, deodorant, foam, etc. under high pressure. These are generally made up of metals such as aluminum, steel, tin along with plastic and glass. Such cans are easy to use, portable and chemically inert and thus used for personal care, home care and industrial use. Increasing demand of aerosol cans, as it is easy to use, portable, and safe to use across all end-use industries is driving the market growth. Wide range of cans depending upon size, shape and use, has increased its use for storing polishes, foams, liquids and other compounds. Increased need for recyclable materials has again pushed the market growth. This detailed market study is centered on the data obtained from multiple sources and is analyzed using numerous tools including porter’s five forces analysis, market attractiveness analysis and value chain analysis. These tools are employed to gain insights of the potential value of the market facilitating the business strategists with the latest growth opportunities. Additionally, these tools also provide a detailed analysis of each application/product segment in the global market of aerosol can. The broad aerosol can market has been sub-grouped into product and application. The report studies these subsets with respect to the geographical segmentation. The strategists can gain a detailed insight and devise appropriate strategies to target specific market. This detail will lead to a focused approach leading to identification of better opportunities. Furthermore, the report comprises of the geographical segmentation, which mainly focuses on current and forecast demand for aerosol can in North America, Europe, Asia Pacific, Latin America, and Middle East & Africa. The report further focuses on demand for individual application segments in all the regions. The report also covers detailed competitive landscape including company profiles of key players operating in the global market. The key players in the aerosol can market includes ARDAGH PACKAGING, Ball Corporation, BWAY, CCL Container, Colep Portugal, Crown Holding Inc., DS Container, EXAL, ITW Sexton Can Company, Inc., Jamestrong Packaging and Nampak. An in-depth view of the competitive outlook includes future capacities, key mergers & acquisitions, financial overview, partnerships, collaborations, new product launches, new product developments and other developments with information in terms of H.Q. ITW Sexton Can Company, Inc.